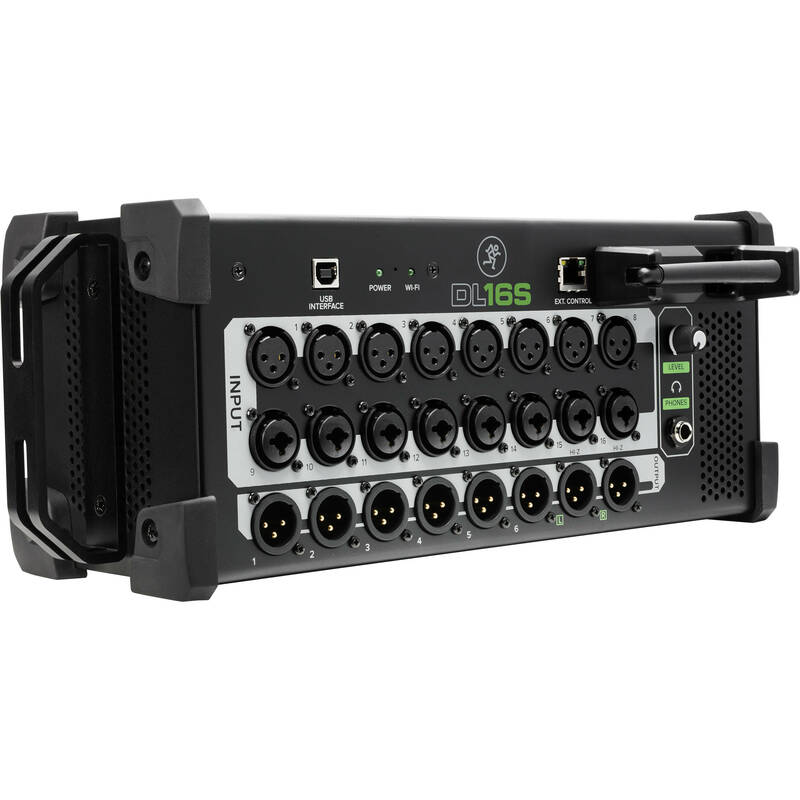 The Mackie DL16S is a 16-channel wireless digital live sound mixer with integrated Wi-Fi, well suited for musicians, engineers, clubs, bars, coffee shops, and more. The mixer features 16 Onyx+ recallable preamps available on 8 XLR inputs and 8 combo XLR-1/4" inputs, while 8 fully-assignable outputs are available on XLR connectors, plus there is a dedicated 1/4" headphone output. The DL16S offers sophisticated signal processing with a 4-band PEQ, HPF, gate, compression, and an RTA/spectrograph for each of the 16 input channels. Each of the 13 output busses offer a 4-band PEQ, HPF/LPF, a 31-band GEQ, compressor/limiter, alignment delay, and RTA/spectrograph. Additionally, there are six VCAs, six mute groups, and four stereo FX processors with professional-quality reverb, delay, chorus, flange, and more. The steel construction and large rubber corners ensure the DL16S can handle the rigors of on-the-road wear and tear. The integrated handle provides an easy carry option for quick deployment, while the built-in Wi-Fi antenna allows you to connect to the DL16's network for seamless wireless control. For greater range, an Ethernet connector allows you to connect directly to a wireless router or network switch. The Mackie DL16S utilizes the Master Fader control app, which operates on an iOS or Android device, as well as Mac and Windows computers (with the soon-to-be released Master Fader 5.1). Navigate quickly with the overview and view groups, and quickly set up channels with factory and user presets, plus recall Onyx+ mic preamp settings. Up to 20 devices can be connected, allowing musicians to create their own headphone mix, while the "Access Limiting" setting prevent unwanted adjustments for the FOH engineer. The integrated 16x16 USB 2.0 audio interface allows you to record the show for a later mixdown or perform a virtual sound check, plus you can play intermission music, backing tracks, and more directly into a dedicated stereo return channel. With a low cost and a high channel and feature count, the Mackie DL16S makes for a budget-friendly yet professional studio recording environment. Box Dimensions (LxWxH) 17.3 x 10.0 x 10.0"
DL16S 16-Channel Wireless Digital Live Sound Mixer with Built-In Wi-Fi is rated 3.0 out of 5 by 1. Rated 3 out of 5 by Glenn from OK, but was hoping for more. I recently purchased the DL16S as an upgrade from a long used and loved DL1608. The smaller size, integrated gain control in the app and Android support brought me to the new DL16S. I was saddened to see that show import/export features available on v4.0 of the app are not available in v5.0. This means that I could not migrate shows from the DL1608 onto the new platform and had to recreate shows from scratch. This is a long and tedious process that I wish could have been avoided. Android support is OK, but not great. I have an 8 Galaxy Tab A that was hoping to use as a monitor mixer for the drummer. Basic monitor mix capabilities are there, but missing is access to EQ. The monitor EQ must be done by the main iPad still. Built in wifi is a nice touch, but the fragile antenna is not ready for a RocknRoll environment as it broke on the first gig out. Now I am back to running it with an external router until I find a compatible (and sturdy) replacement antenna. Could matrix mixes be added to this via software update in the future? The Mackie DL16S is a live mixer not a matrix mixer. So it is very unlikely that you will be able to add matrix mixes via the software. Can you rack mount this? Yes! The DL16S includes the rack ears in the box with the product. It takes up 3 rack spaces.